Sink your teeth into Yo-Dot's Burleigh Bodega appetizer, "Until"
We’ll learn more details at a Brewers press conference set for 2 p.m. today, but for now, there’s big news floating around town: MillerCoors’ naming rights for Miller Park will expire in 2020; after that, American Family Insurance will take over as the naming-rights sponsor of the ballpark. Goodbye, Miller Park? Hello, American Family Insurance Park/Field/Forum? Twenty years ago our company stepped forward to help keep the Brewers in Brew City USA, a move that built on our longstanding relationship with the team and our commitment to Wisconsin—whether that’s at Packers and Bucks games, at Summerfest and the State Fair or in backyards and beer bars. While the name on the stadium will change after the 2020 season, we fully expect Brewers fans inside and outside the stadium will continue to celebrate every home run and every strike out with one of our beloved brands. Miller has been the sole naming rights sponsor of the stadium since it first opened in 2001. In 1996, the company purchased those rights through the 2020 season for $40 million. Meanwhile, American Family Insurance became a presenting sponsor of Summerfest in 2017. The Marcus Amphitheater was subsequently renamed the American Family Insurance Amphitheater. The Milwaukee Brewers and American Family Insurance today announced a long-term agreement which includes the naming rights for Miller Park beginning in 2021 and continuing for 15 years. The future name and branding elements for the stadium will be announced at a later date. The partnership goes well beyond the naming rights to the ballpark. The Brewers and American Family Insurance will collaboratively fund community projects, including refurbishing youth and high school baseball fields. The two organizations will also work on marketing and promotional initiatives to enhance the fan and customer experience in both the stadium and in the community. Founded in 1927 and based in Madison, Wisconsin, American Family Insurance is the largest provider of personal auto and homeowners insurance in Wisconsin. American Family Insurance will succeed MillerCoors, the title sponsor of Miller Park since the ballpark opened in 2001, the same year that American Family Insurance started its marketing partnership with the Brewers. The stadium will retain the Miller Park name through the conclusion of the 2020 season. The final five years of the naming rights agreement is predicated on an extension of the Brewers stadium lease. The lease currently runs through the 2030 season. Miller Park has hosted over 46 million visitors to baseball games in its first 18 seasons, an average of more than 2.5 million fans per season. Over 3 million fans attended games at Miller Park during the 2018 season. 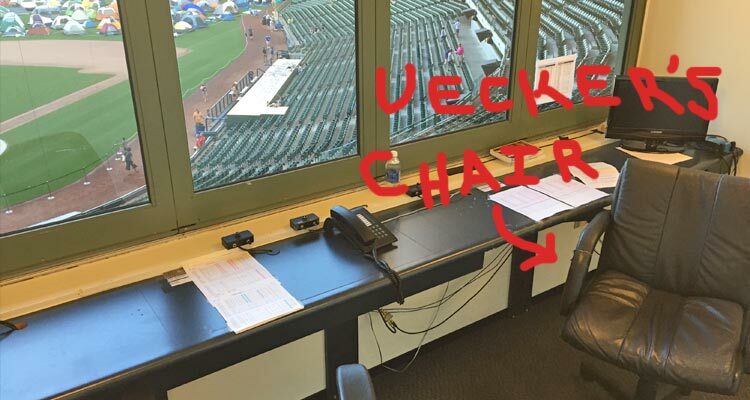 And here’s Uecker’s chair. Overlooking Miller Park.